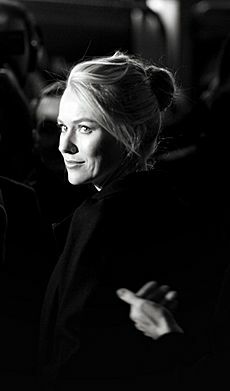 Naomi Ellen Watts (born 28 September 1968) is an English actress and film producer. She made her screen debut in the Australian drama film For Love Alone (1986) and then appeared in the Australian television series' Hey Dad..! (1990), Brides of Christ (1991), Home and Away (1991), and the coming-of-age comedy-drama film Flirting (1991). After moving to the United States, Watts appeared in films, including Tank Girl (1995), Children of the Corn IV: The Gathering (1996), and Dangerous Beauty (1998), and had the lead role in the television series Sleepwalkers (1997–1998). After years as a struggling actress, Watts came to attention in David Lynch's psychological thriller Mulholland Drive (2001). The following year, she enjoyed box-office success with her role as Rachel Keller in The Ring (2002), the remake of a successful Japanese horror film. She then received nominations at the Academy Awards and the Screen Actors' Guild Awards in the Best Actress categories for her portrayal of Cristina Peck in Alejandro González Iñárritu's neo-noir 21 Grams (2003). Her subsequent films include David O. Russell's comedy I Heart Huckabees (2004), King Kong (2005), a remake of the 1933 film of the same name, the crime-thriller Eastern Promises (2007), and the Tom Tykwer-directed thriller The International (2009). Since then, Watts has portrayed Valerie Plame Wilson in the biographical drama Fair Game (2010) and Helen Gandy in Clint Eastwood's biographical drama J. Edgar (2011). For her leading role as Maria Bennett in the disaster film The Impossible (2012), she received further nominations for the Academy Award and Screen Actors Guild Award for Best Actress and a nomination for the Golden Globe Award for Best Actress. Watts was born on 28 September 1968, in Shoreham, Kent, England. She is the daughter of Myfanwy ("Miv") Edwards (née Roberts), an antiques dealer and costume and set designer, and Peter Watts (1946–1976), a road manager and sound engineer who worked with Pink Floyd. Miv was born in England but lived in Australia between the ages of one and seven. Watts' maternal grandfather was Welsh and her maternal grandmother was Australian. Watts' parents divorced when she was four years old. After the divorce, Watts and her elder brother, Ben Watts, moved several times across South East England with their mother. Peter Watts left Pink Floyd in 1974, and he and Myfanwy were later reconciled. Two years later he died. Following his death, Watts' mother moved the family to Llanfawr Farm in Llangefni and Llanfairpwllgwyngyll, towns on the island of Anglesey in North Wales, where they lived with Watts' maternal grandparents, Nikki and Hugh Roberts, for three years. During this time, Watts attended a Welsh language school, Ysgol Gyfun Llangefni. She later said of her time in Wales: "We took Welsh lessons in a school in the middle of nowhere while everyone else was taking English. Wherever we moved, I would adapt and pick up the regional accent. It's obviously significant now, me being an actress. Anyway, there was quite a lot of sadness in my childhood, but no lack of love." In 1978, her mother remarried (though she would later be divorced again) and Watts and her brother then moved to Suffolk, where she attended Thomas Mills High School. Watts has stated that she wanted to become an actress after seeing her mother performing on stage and from the time she watched the 1980 film Fame. Watts was in a relationship with actor Heath Ledger from August 2002 to May 2004. 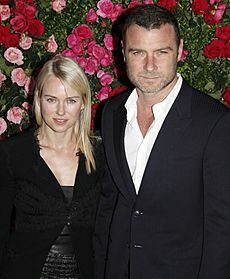 In the spring of 2005, Watts began a relationship with actor Liev Schreiber. The couple's first son, Alexander "Sasha" Pete, was born in July 2007 in Los Angeles, and their second son, Samuel "Sammy" Kai, in December 2008 in New York City. On 26 September 2016, Watts and Schreiber announced their separation, after 11 years together. Naomi Watts Facts for Kids. Kiddle Encyclopedia.